Work in the garden in the month of March: how to care for your garden? Spring days and I look forward to summer visitors, andtheir gardens to give a start to the new season. But more often than the first month of spring on the calendar only shows the change of seasons. In reality, continue to fry frost, snowdrifts lie, and like in the garden is to do nothing. In fact, in March, there is the approach of heat, lengthens the day and the trees gradually begin to emerge from a period of hibernation. Therefore, some work in March, still carried out in the garden. They did not so much as to be in May, but the yield of fruit trees and abundant flowering ornamental shrubs largely depend on the March departure. How to use the snow for the benefit? In temperate climates to almost half of Marchin the gardens of snow. But because of the daytime thaws, it becomes loose, soaked and heavy with. If the branches of trees and bushes (especially young!) Are covered with luxurious hats, arm and pointed a long stick to shake it. Great weight of snow stuck to the branches can easily break, because they have not yet acquired the elasticity and remain fragile, the frozen. 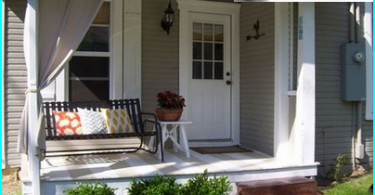 In low-lying areas where drainage is laid, too clean snow and clean the rainwater grooves. Excess moisture is useless, so it can be reduced by pre-clearing the land. However, all the snow existing on the ground needto use to advantage. 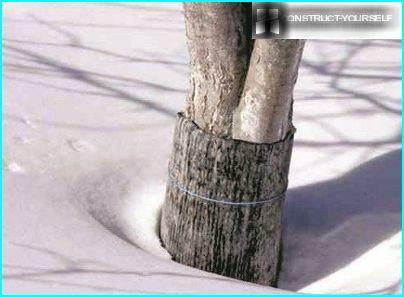 Remove the snow shovel with a layer of beds, so they quickly warmed up, and lay in the trees near barrel circles. 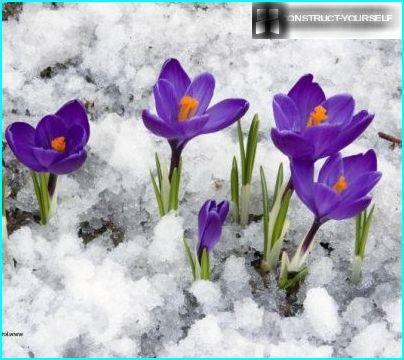 He suspends the rapid thawing of the root, which is quite dangerous in March. Dark soil warms up quickly, and sap flow may begin before will be night frosts. A living, awakened branches are very sensitive to freezing temperatures and rapidly freeze slightly. With a large amount of snow, divide it between the trees, raspberries and strawberries with the beds. 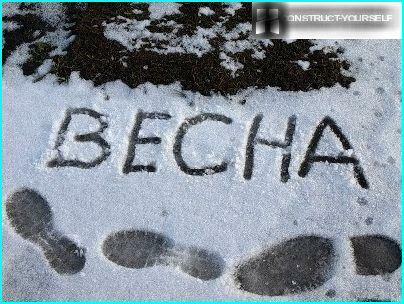 If you are somewhere sprinkled cuttings, twigs forvaccinations, then scribble snow on them, and on top sprinkle sawdust. Those will reflect the sun's rays and slow the melting of snow "coat". Who has not had time to prepare cuttings in autumn, can cut them now, with the proviso that the winter was not too frosty (not below -25 °) this year. They hide in the same shoulder with a cap of snow on top of the sawdust. 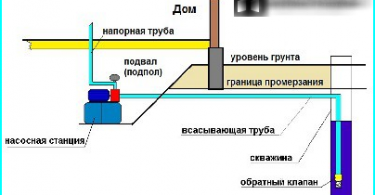 In areas with a strong bias is created fromSnow horizontal shafts. They will delay the snow when it melts and the ground gets more moisture. 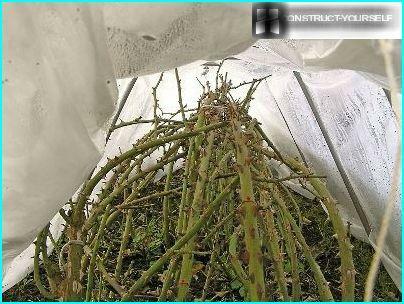 But the shelter for the winter rose bushes, rhododendrons, hydrangeas and other heat-loving culture with the advent of warm days should be slightly open, giving access to the air to the roots. In this case, you prevent the formation of mold, who loves secluded place with high humidity. Since March, more often observed jumpstemperatures from sub-zero at night to + 10-12 ° during the day, the bark can quickly readjust to such a regime. As a result, in the sun trunks and branches receive burns, and at night - frost-crack. To protect the garden from damage, it is in the beginning of March (and not before Easter!) Spend spring whitewashing of trees. You can buy lime and quenching in boiling water, but you can only paint. Blanch in a windless day at zero temperature outside. Besides the trunks, it is very sensitive to the Marchsun broom coniferous ornamental shrubs. They steadfastly outsource frost in -40 °, but under the scorching sun tender top branches will be burned immediately. Therefore, in early March rare conifers (arborvitae, junipers, etc. ), And of the evergreen - box-trees have to hide non-woven fabric or wrap and tie the newspapers. During the winter, some trees could getdamage in the form of frost-crack, podmerzshie branches, cracked bark. Prior to the sap flow is necessary to treat and heal the wounds, and all that is destroyed by frost, - cut. The wounds cleaned with a knife until healthywood coat with copper sulfate (per liter of water 10 grams) and close up garden pitch. If you find a solution in the sale of succinic acid, it accelerates healing. This composition is lubricated cut trunk space, and then the remaining processing is carried out. To check which branches podmerzli over the winter, enough to cut the tops and look at the wood. If it is light, the living if turned brown - cut the more. 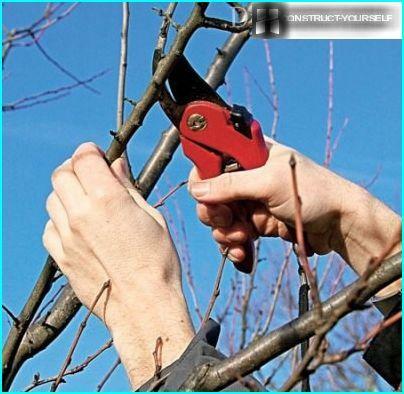 In March, it's time to spend the spring pruning to remove frostbitten or incorrectly growing branches. This will certainly have to wait until a stable temperature above zero. which overlap and cling to others. Try to cut, not to stump remained. Place saw cut promazhte garden pitch. Fruiting shrubs are typically formed in the fall,so in March only corrected what was left unnoticed. Cut off otplodonosivshie branches of raspberry, old trunks currant and gooseberry. The tops of young raspberry branches are pruned to 10 cm, so that the berries were larger. Ornamental shrubs pruned, too, taking into accountvymerzshih branches during the winter. If you fall, you do not have time to trim forsythia, lilac, jasmine and other plants that are beginning to bloom early, then it is better not to touch. Otherwise, the bush will bloom poorly. If they are slightly podmerzli is shortened exactly to the place where the living tissue begins. When pruning any plant waste directly burned or crushed and lay in the compost pit. As soon as the snow thawing mouseleaving a hole and go into cellars and basements. To destroy rodents spread out in secluded villages etched grain or garden use different lures. 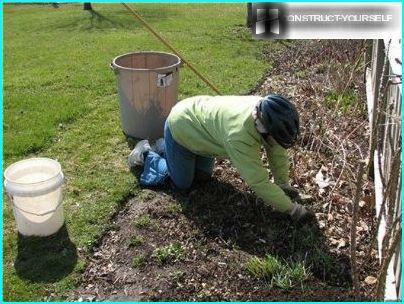 All sorts of small pests, overwintering in the bark of trees, destroy the chemical and physical methods. For this purpose, each barrel wear a special belt huntsman. After the restoration of the street stabletemperature (greater than 5 °) are sprayed with insecticide all the garden. Simultaneously, the solution can be added to preparations for the prevention of diseases of trees, such as Bordeaux mixture. For low-growing shrubs do not applychemicals and hot water treatment. Gooseberries, currants poured from a watering can, trying to get to every twig. Liquid temperature - 70 °. To the beds of strawberries is enough 60-degree shower. After the snow melts completely, inSome perennials and shrubs may expose you to the top of the root system. Its just vypret from the ground while driving the moisture. To keep the plant healthy, all protruding roots should be zamulchirovat peat or humus. But first, the plant 'implanting', ie trying to return to its original location in the ground, gently crushing the soil to the roots settled below. Thawed lawn also requires care. It is necessary to rake flown over the winter debris. Just use this easy fan rake, which is not deepened into the ground. Otherwise, you can pull out of the soil moist many blades of grass. If there were bald patches, overseeding these places. Unexpected Morozik only harden the seeds and they will ascend more friendly. 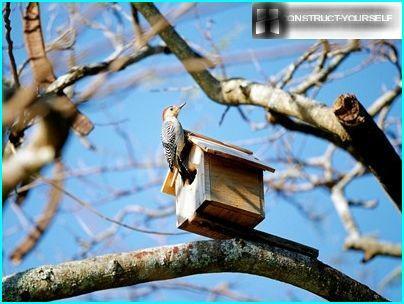 By mid-March, it is desirable to put up houses for birds, if you want to attract birds to protect their possessions from pests. Two birdhouses enough for Garden maintenance in 10 acres. 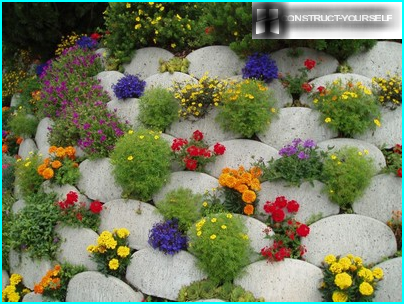 At the end of the month after thawing of the soil spend fertilizing with nitrogen fertilizers. They stimulate the rapid growth of young shoots and leaves. Grapes and Roses in late March is possible to release from the winter shelter, provided that the frost finally left your possession. As you can see, in March, growers do not have to be bored. And when you consider that this month begin to sow the seeds, seedlings dive, then trouble the hosts will be a mouthful.